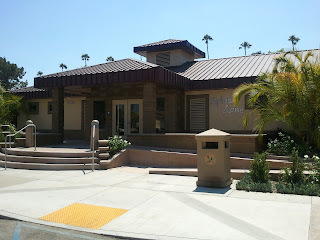 Splash Zone entrance. Plenty of street parking. 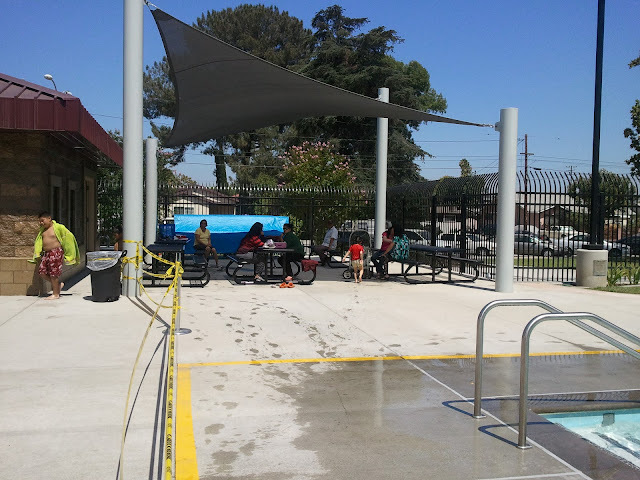 Splash Zone mini-water park, located at Garvey Park in Rosemead, is a huge hit with families. 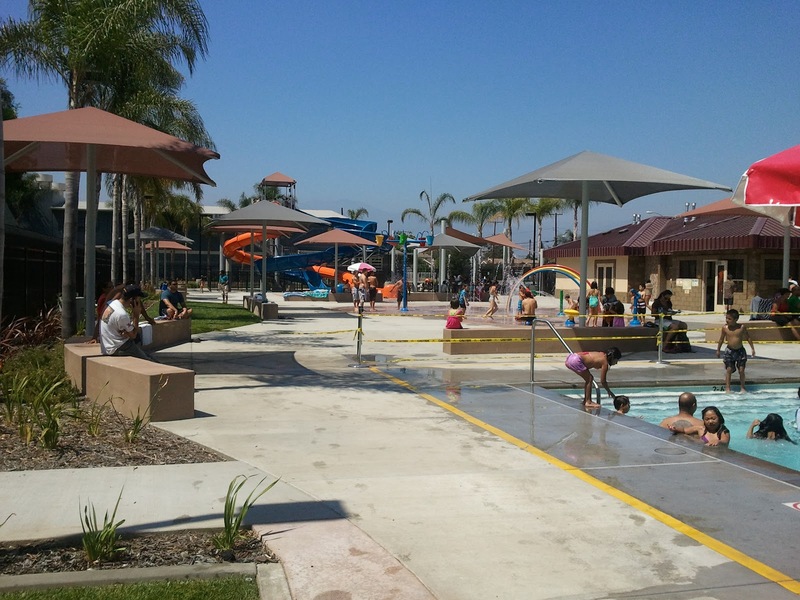 The facility features two water slides, a splash pad, and a 100 person capacity pool. Swim wear is required to play in all three Splash Zone areas, but regular clothes are allowed for guests who want to sit and observe. 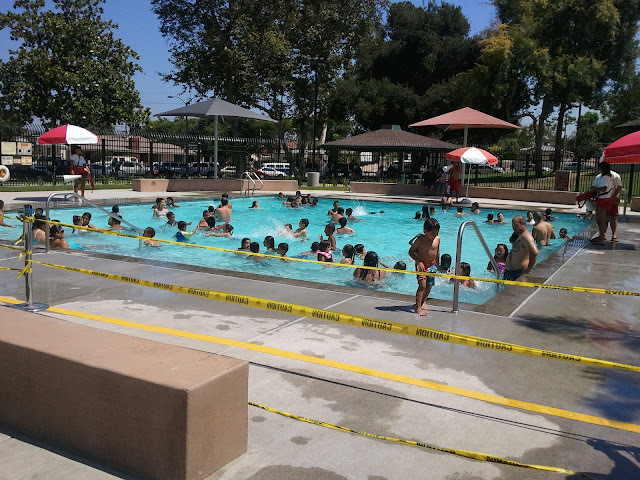 If you have questions visit Rosemead's Aquatic Center website, or call Splash Zone during operating hours at (626)569-2270. Splash Zone is available for private parties. Splash Zone is open for 2016!! Open 7 days a week through 8/12. Then nights/ weekends through end of August. 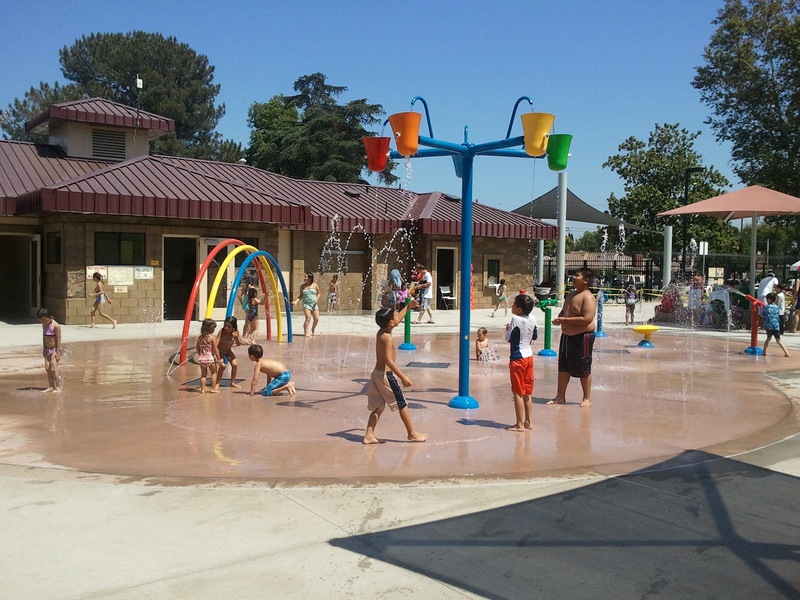 Rosemead residents can purchase season passes. Two water slides. Riders must be 40 inches tall to ride. Splash Pad, similar to the one at Grant Rea Park, but this one is a bit larger. The pool is shallow. Near the steps it's 2.5 feet, the deep end is 4.5 feet. When the pool reaches capacity, the life guards block it off with caution tape. Splash Zone guests then have to make a line to enter as other guests exit. Kids 6 and under must be accompanied by an adult in the pool. A view of the whole park from the far side of the pool. There are two picnic areas, this one near the pool. Most families bring snacks and/or lunch. Some bring in coolers on wagons, camp chairs, and blankets (for the small grassy area). The second picnic area to the right of the slides. There are a lot of shaded areas for parents to rest throughout Splash Zone. 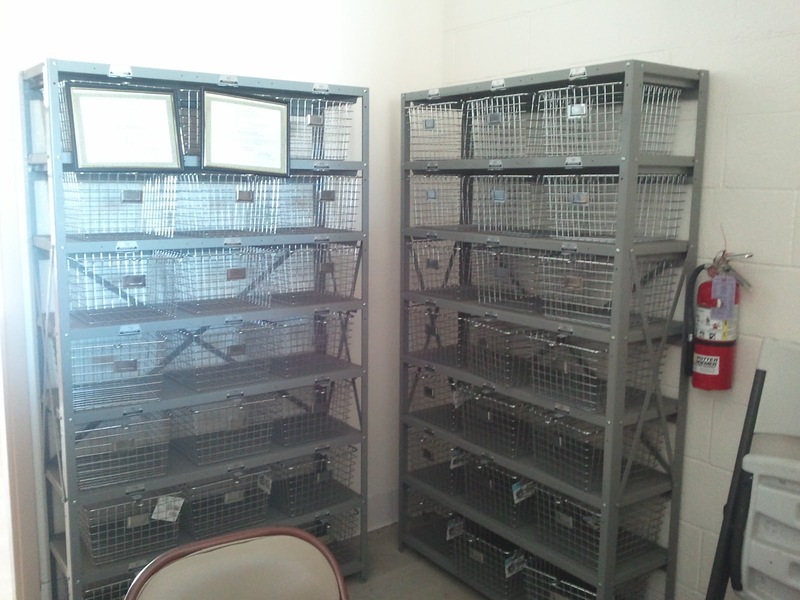 There are male and female locker rooms, with toilets, sinks, showers, baby changing table, and a changing area with lockers. 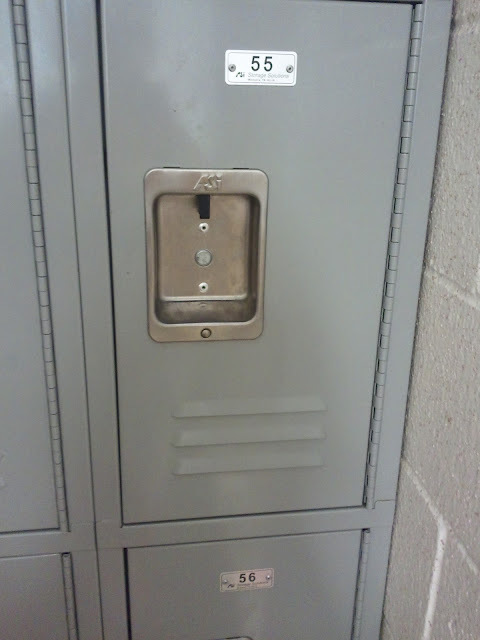 Lockers are free to use and measure about 10 inches deep by 18 inches high, bring your own lock. If you plan on swimming and don't have a lock for the lockers, ask at the entrance for a basket to store your belongings in the lifeguard area. 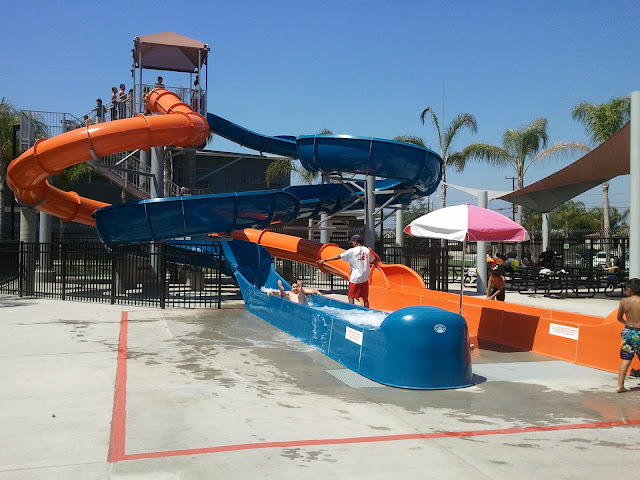 CAVEAT: My cousin visited Splash Zone with her family on a hot weekend. She said it was packed. There was a line waiting to enter the facility and guests were only allowed to enter as other visitors exited due to capacity limitations. Once inside everyone was rotated out of the pool area, 30 minutes in the pool, then everyone was asked to visit another area while others were allowed in. She said it wasn't too fun. 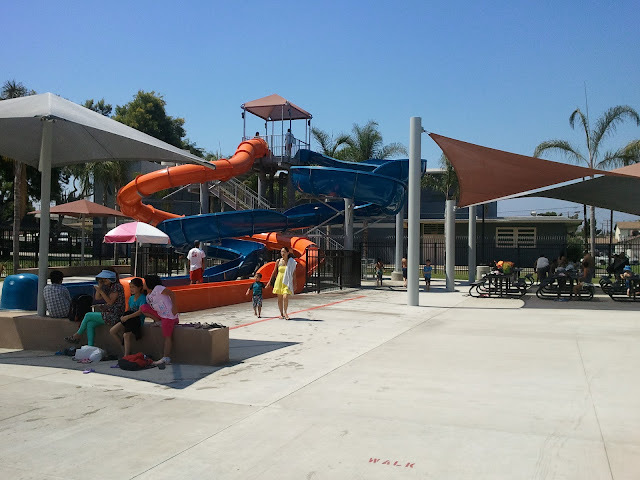 I only visit Splash Zone with my kids on weekdays, and on days where it isn't scorching hot; I've always had a pleasant experience. If it's a really hot day, or you visit on the weekend, it will probably be very crowded. Plan to arrive at least 15-30 minutes before the center opens. Lines to enter form very early on peak attendance days. 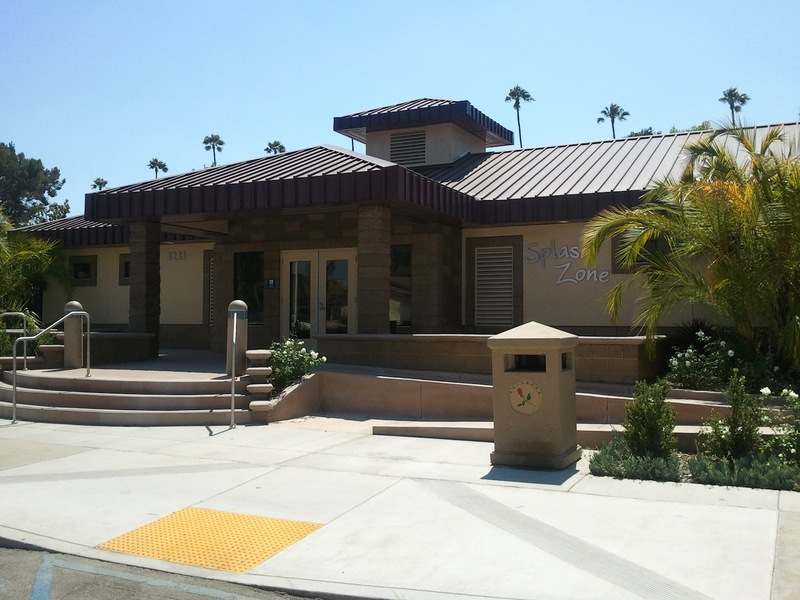 CAVEAT #2: Near the end of the summer season in 2013, Splash Zone's hours of operation changed without notice. Double check the hours of operation later in the summer season. 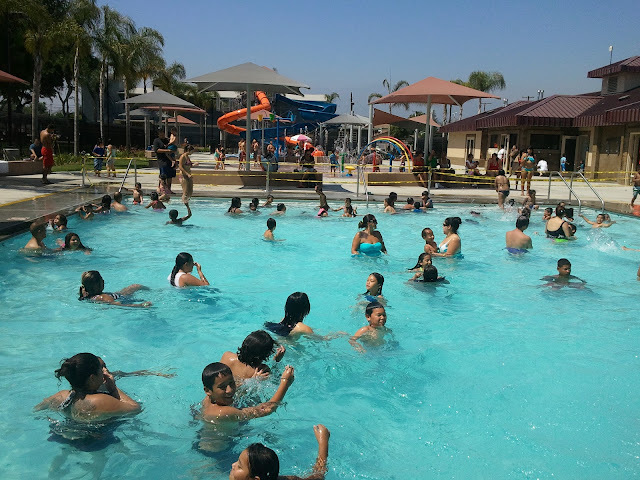 Montebello and the surrounding area, please "Like" Montebello Mom on Facebook, or subscribe to the e-mail newsletter on the sidebar. Thanks for visiting! Wow...this is awesome!!! I love it. It's on my list of things to do this Summer. I'm not telling my son about it, I'll just go there and surprise him. Thank you for your amazing and dedicated time to helping us moms find things to do. I second that. Finding affordable, fun and safe summer activities is crucial in our communities in order to keep our children off of the streets and out of trouble. Thank You! That's a great price on admission and I like the options for storage and the picnic tables. I just found out about this place, it's not opening it but a looks pretty awesome, I'm not going to tell my kids in tow it opens and I'll take them that they're gonna love it!! Wow Julie, thank you for sharing about the changes. I haven't visited Splash Zone this season and wasn't aware of the new rules. I'll see if I can get in contact with the staff there and see what information they can give me to share with my readers. Thank you again for writing.